Lyrica Fibromyalgia in kids: the mafia is at it again! Another so-called study on this horrible drug called Lyrica. After showing its inefficiency on adults with fibromyalgia to the point that Europe has not recognized it for use in fibromyalgia, they now embark on adolescents. They start by telling us it is a randomized double blind study to make it appear serious. But because they do not get good results, they dig out sub-groups that were not defined as target points before the study. Because of this usual bias, they are able to show some “tendencies” towards betterment. In fact, in the conclusion, those tendencies occupy more than half the paragraph! I have had a close look at the article and this is what I have found. First, in a small and limited population there is more than 25% drop out! 27 out of 107 is an enormous drop out! And that is occurring in a study involving 36 centers. One wonders how many centers had only drop-outs or were they disguised? Secondly, have a look at the authors. 9 authors among which 6 are full employees and shareholders of the Pfizer group producing this terrible drug that should never have reached the market! 6 out of 9! That’s a staggering 2/3 !!!! Looks like a mafia style! 6 non-independent people in a 9 people reunion! And of the remaining 3 authors one is in so much cahoots with Big Pharma that her name in an article should draw suspicion! Lyrica Fibromyalgia in kids ? Does not work in adults ! It reminds me of one of my dear colleagues. I did point out the repeated lies of Pfizer, which has now given this pharmaceutical company the gold medal of money sanctions. He answered that without them we would not have the magnificent drug Lyrica which is the one that attracted onto them the FDA! They should have been suspended for repeated conspiracy but the Washington powers have too much to lose! So, I am amazed this crap reached publication! How could it get through peer-review? How can a journal whose title is PEDIATRIC Rheumatology accept this? No consideration for our kids? They are prepared to embark them on the third cause of mortality which is bad medicine! Medicine has now reach the unenviable bronze medal of mortality and surely the gold one for preventable mortality! Lyrica Fibromyalgia in kids ? I am sick and tired of this situation. 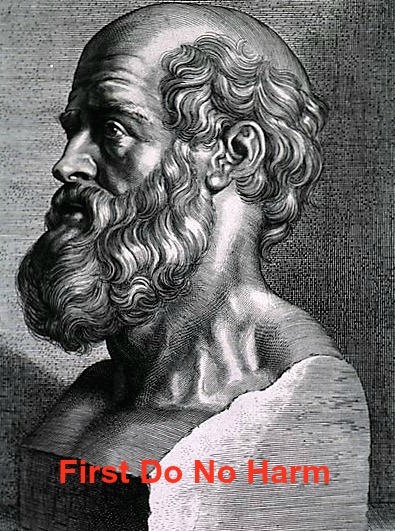 Hippocrates, the father of medicine, said it more than 2000 years ago: “FIRST DO NO HARM”! Big Pharma, their University accomplices and the Medical Printing Industry are vultures feeding on us and now on our kids! Long ago, I have decided to fight this mafia! And if this could cost me, I remember that I got into medicine for one reason: fight diseases. And this is by far the biggest disease to fight! Pediatr Rheumatol Online J. 2016 Jul 30;14(1):46. Arnold LM1, Schikler KN2, Bateman L3, Khan T4, Pauer L4, Bhadra-Brown P5, Clair A5, Chew ML4, Scavone J4; Pregabalin Adolescent Fibromyalgia Study Group. Fibromyalgia (FM) is a common pain condition characterized by widespread musculoskeletal pain and tenderness. Pregabalin is an approved treatment for adults in the United States, but there are no approved treatments for adolescents with FM. This was a 15-week, randomized, double-blind, placebo-controlled study and 6-month open-label safety trial of flexible-dose pregabalin (75-450 mg/day) for the treatment of adolescents (12-17 years) with FM. Primary outcome was change in mean pain score at endpoint (scored from 0-10, with 24-h recall). Secondary outcomes included global assessments and measures of pain, sleep, and FM impact. A total of 107 subjects were randomized to treatment (54 pregabalin, 53 placebo) and 80 completed the study (44 pregabalin, 36 placebo). Improvement in mean pain score at endpoint with pregabalin versus placebo was not statistically significant, treatment difference (95 % CI), -0.66 (-1.51, 0.18), P = 0.121. There were significant improvements with pregabalin versus placebo in secondary outcomes of change in pain score by week (P < 0.05 for 10 of 15 weeks); change in pain score at week 15 (1-week recall), treatment difference (95 % CI), -0.87 (-1.68, -0.05), P = 0.037; and patient global impression of change, 53.1 % versus 29.5 % very much or much improved (P = 0.013). Trends toward improvement with pregabalin in other secondary outcomes measuring pain, sleep, and FM impact were not significant. Safety was consistent with the known profile of pregabalin in adults with FM. Pregabalin did not significantly improve the mean pain score in adolescents with FM. There were significant improvements in secondary outcomes measuring pain and impression of change. Lyrica Fibromyalgia in kids: the gabapentin mafia is at it again!